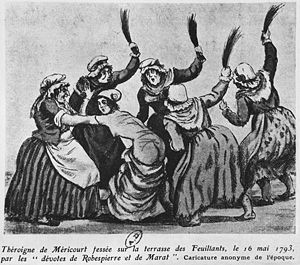 Illustration of May 1793 attack on French Revolution organizer Théroigne de Méricourt by Jacobin women. France, officially the French Republic (French: République française), is a country in Western Europe. It has a population of more than 65.3 million. Its official language is French, and its capital and largest city is Paris. Previously known as Gaul in the era of the Roman Empire (27 BC-5th century AD), the medieval Kingdom of France emerged around the 9th century, and was ruled by a series of kings until the French Revolution in 1789, which saw the collapse of the monarchy and associated institutions. Napoleon Bonaparte rose to power after the revolution and ruled over the French Empire in the 19th century until he was defeated by a coalition of many European states in the Napoleonic Wars, after which France underwent many regime changes. France participated in the two World Wars in the 20th century and its current government, the French Fifth Republic, was established in 1958. For the past five centuries, France has been a major power with strong cultural, economic, military, and political influence within Europe and around the world. It is now a highly developed country with the fifth largest economy in the world and very high standards of living, education, and healthcare. From Antiquity to modernism, spanking was as popular in France as in the rest of Europe, and its use as a parenting tool greatly reduced in the 2nd half of the 20th century. Nonabusive spanking isn't illegal in France however, as in Sweden, Germany and other European countries. On 23 December 2009, Paris MP and paediatrician Edwige Antier has proposed a bill which would prohibit corporal punishment, including spanking of children. The French gave the world a special spanking implement: the martinet. Une Femme de condition, fouetté pour avoir craché sur le portrait de Mr Necker ("A woman, being spanked for spitting on the portrait of Mr Necker".) Illustration from the time of the French Revolution (1789). 95% of the grandparents, 95% of the parents and 96% of the children got spanked. The spankings came mainly from their parents. Non-parental spanking has decreased over the last three generations: 52% of the grandparents (58% boys, 46% girls), 39% of the parents (50% boys, 27% girls) and 34% of the children (37% boys, 30% girls) have been spanked by a third party, at school, or other family members. 62% (grandparents), 64% (parents) and 55% (children) found that the spankings were (largely) deserved (this increased to over 60% among older children). 34% of grandparents, 25% of parents and 22% of children feel they were punished too much; 7% of grandparents, 9% of parents and 9% children feel that they have been punished not enough. 64% of the children intend to raise their own children as they were, 22% less severe, 14% more severe (but 18% of older children would raise their children more severely). 26% of the children want more spankings in education. Children that would be less severe in their education, would not ban all spanking, but would give less spankings on the bare bottom (many notes), not use the hairbrush or martinet, or limit the number of strokes. 27%, 34% and 37% of the grandparents, parents and children want to forbid corporal punishment by law. But even these often want to make a difference between corporal punishment and “a spanking” (meaning hand-spanking), which is not considered a corporal punishment. Illustrated spanking novels were published a lot in France between the 1900s and the 1930s (see early 20th century French spanking literature). So there is a lot of French spanking art from these decades. Artists of that era include Don Brennus Aléra, Lewis Bald, N. Carman, Maurice de Vindas, Pierre Dumarchey, J. X. Dumoulin, Fontana, Louis Malteste and Georges Topfer. Contemporary French artists include Azraël, ArnDaBrat, Davcha, erik, and Flatt. Satire of French history from Ostra Studio (c. 1930s). 1930s French erotica from Ostra Studio. Spanking drawing by Louis Malteste.